On the 25th of January 2011 “Riga Aeronautical Institute” and the organization “EUROCONTROL” has concluded an agreement on using a unified European Aeronautical Database (EAD). Under this agreement, RAI is entrusted to provide training of AIS specialists on using EAD database. EAD is a centralized reference database of quality-assured aeronautical information for airspace users and an integrated AIS solution for service providers. Training of specialists is provided in RAI Training Center according to Maintenance Training Organization Exposition (MTOE). 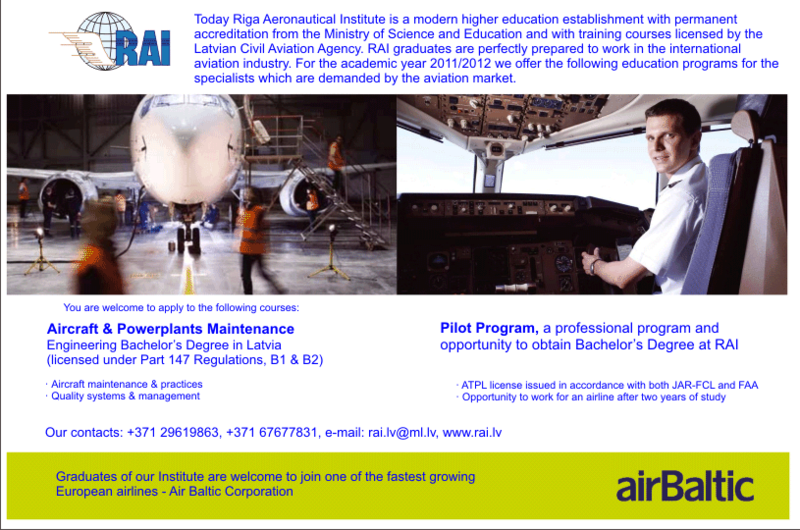 Riga Aeronautical Institute (RAI) is an accredited institute of higher education, implementing training of high-class specialists in all areas of aviation industry. Alongside with other aviation specialties our Institute is licensed for pilot training on programmes approved in conformity to the European JAA, Part 141 Regulations, FTO. At the Institute a full range of programmes is available starting with Private Pilots to Airline Transport Pilots. The Institute performing professional training since 1942, has prepared during the years of its existence over 40 thousand aviation specialists. In recent years RAI expands and consolidates cooperation with the centres of countries of European and USA, leading in the field of flight training, having long-term experience and world recognition in terms of training of highly qualified private and professional pilots from over 48 countries from all continents. Today RAI is proud to offer the pilot training options on joint programmes according to both JAA and FAA standards.